About Vest Carriers - buy vest carrier bags at fantastic discount prices or design your own carriers - get a quote in 60 seconds! 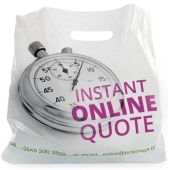 Vest Carriers is a division of Polybags Ltd, the UK's number one polythene packaging manufacturer, to highlight their provision of vest carrier bags and printed carriers at fantastic discount prices. 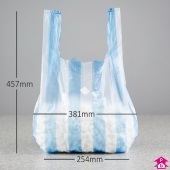 Polybags produces first class polythene and polypropylene products at competitive wholesale prices and supplies them direct to the customer, avoiding the usual markup that other merchants have to apply. All orders placed with Vest Carriers are fulfilled directly by Polybags' service team with no commission or hidden costs added. Carrier bags are the classic shopping accessory. They come in all sorts of shapes and sizes to suit the products being sold and the retailer's branding. Polybags' range of carrier bags sold off-the-shelf covers any type of bag you need, whilst you can also make your own bespoke carrier bag, printed with your design. Mailing bags are polythene envelopes that are ideal for posting items in the mail or by courier. Strong, lightweight and waterproof, mailing bags - also known as courier bags - offer a fantastic alternative to regular envelopes or parcels. Made of polythene containing lots of tiny air-filled bubbles adjacent to each other, bubble packaging protects delicate or fragile items from bumps and scrapes. Bubble wrap and bubble bags offer air-cushioned protection, making them perfect for keeping delicate or valuable items safe in storage or transit. Available in a variety of sizes. Polybags stocks a wide range of eco-friendly packaging developed in the laboratory in line with the latest research findings, to maximise their green credentials. 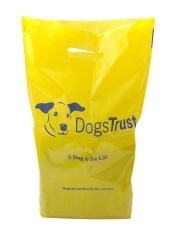 From kitchen caddy liners to dog poo bags and biodegradable mailing bags to carrier bags, you can get the job done whilst doing your bit for the environment. Polypropylene film is a superior alternative to cellophane that offers increased strength and extra clarity despite being cheaper! 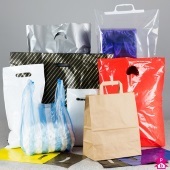 Crystal clear retail display bags made from polypropylene film provide the perfect way for retailers and manufacturers to show off their products and add some sparkle to displays. Pack away your items in storage with confidence with Polybags' range of plain packing bags. Available in a range of sizes and thicknesses, they also come in handy for cover items during a house move or while decorating. Polybags stocks a huge range of packing accessories to use with their polythene bags, tubing and sheeting. Whatever you're packing, if you need an extra something to pack the product - from bag ties and clips to box labels and heat sealers to stretchwrap - Polybags have got you covered, with a next day delivery option if required.